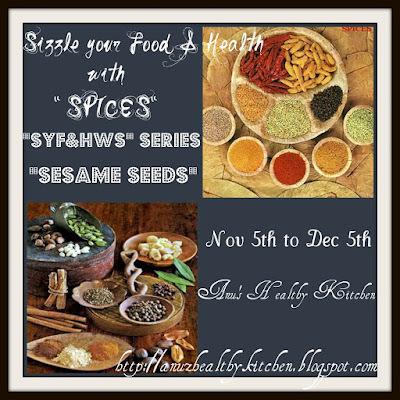 Sizzle Your Food and Health With Spices, SYF & HWS is an event founded by Anu of Anu's Healthy Kitchen. I am guest hosting the event for the month of November and the spice is Sesame. The event runs from Nov 5 to Dec 5.
in the form of paste as tahini paste or as the strong and pungent sesame oil. This month's event looks at trying to use sesame, in of these three forms in an innovative way; not only trying to create dishes that would definitely not be complete without the use of sesame, but also creating dishes that usually do not sprout in our kitchen. So let's get out of our comfort zone, put our thinking caps on and make some dishes with Sesame (Seed, Paste or Oil). 1. 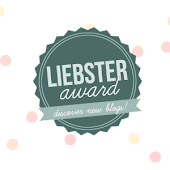 Bloggers and Non-bloggers are welcome to send in any number of recipes; archived ones have to be re-posted and linked to this event announcement page and Anu's event announcement page. 2. Vegetarian and Non-vegetarian dishes are welcome for this event - but something out of the ordinary. 3. Use of LOGO is mandatory as this will help spread the word. 4. Follow my blog using Google Friend Connect or Like my facebook page https://www.facebook.com/MyFoodTreasures. 4. Non-bloggers can send in their recipes with photographs to lovetoexp(at)gmail(dot)com. 5. Event for this month runs through Nov 5, 2012 to Dec 5, 2012. 6. Please send in as many recipes as you want. This is an on-going event and if anyone is interested to guest host this, please drop in an email to anu(dot)healthykitchen(at)gmail(dot)com or drop in a comment on her Event Calender. She will be happy to remind you about the event a week in advance and also send you the event logo for the particular month and event announcement page. You will only have to copy and paste the document as a Guest Event Post. Looking forward to receive some wonderful recipes. Please use linky tool below to link recipes (activated from Nov-5).